Centrum Wiskunde & Informatica: Automatic and Manual Processes in End-User Multimedia Authoring Tools: Where is the Balance? 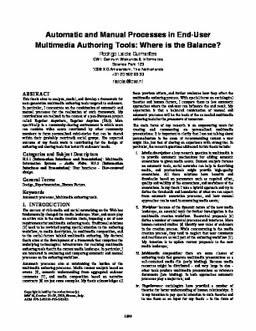 Automatic and Manual Processes in End-User Multimedia Authoring Tools: Where is the Balance? This thesis aims to analyze, model, and develop a framework for next-generation multimedia authoring tools targeted to end-users. In particular, I concentrate on the combination of automatic and manual processes for the realization of such framework. My contributions are realized in the context of a pan-European project called Together Anywhere, Together Anytime (TA2). More specifically in a community-sharing environment in which users can combine video assets contributed by other community members to form personalized mini-stories that can be shared within their (probably restricted) social groups. The expected outcome of my thesis work is contributing for the design of authoring and sharing tools that better fit end-users' needs.